This week: proximity-activated LEDs in an engagement ring, the heroes and the villains of the LED lighting world, and the way to get a bridge lit up by LEDs. We're getting a weekend jump on the Monday Roundup, because of the Memorial Day holiday in the US. Lux Review, a periodical out of the UK, has an opinion feature on the people and organizations deserving to be listed among the good guys and bad guys of the LED lighting scene. Depending on your browser, the link may not open directly to the article in question. If it doesn't, click Start Reading and then Contents. At the top of the heroes list is Shuji Nakamura; without his blue and phosphor-converted white LEDs, none of us would be here. "Slippery salesmen" top the villains list. The really interesting case is Zhaga; it shows up on both lists. This consortium aims to standardize form factors and connectivity across LED light sources. Does Zhaga enable interoperability? Does it stifle creativity? Perhaps a little bit of both? We discussed projects to illuminate bridges with LEDs last month, and we noted the reluctance being felt in various locales to fund such projects out of common or municipal funds. The projects that seemed to be thriving were those paid for by fundraising campaigns. We can add two more bridge projects to the volunteerism side of the roster: the High Level Bridge across the North Saskatchewan River in Edmonton, Canada, and the Memorial Bridge spanning the Piscataqua River between Portsmouth, N.H., and Kittery, Maine. In Edmonton, a grassroots campaign is working to raise $3 million to install 60,000 individually addressable LED lights on the 777m (2,549ft) span. That campaign got a boost when a 100-year-old woman, who was born the year the bridge opened, pledged $2,500 to buy 25 LEDs. The Memorial Bridge fundraising effort is much more modest. Volunteers were asking for only $200,000 to light the 366m (1,201ft) bridge. The campaign met its goal when Archer Western, the contractor working on a replacement for the 90-year-old bridge, pledged the final $50,000. File the next two items under "alternative ways to power LEDs." Danielle Trofe has introduced a design for an LED lamp in the form of an hourglass. Falling sand provides the energy to keep the light shining. A human has to invert the lamp periodically -- thus being the ultimate source for the lamp's energy. Once upon a time, a boy met a girl. Then a short amount of time later, the boy decided to design and build a ring for the girl, because doing things in the most complicated way possible is just what he does to show the love. This is that story. Thus begins the saga of a heroic DIY project worthy of Maker Faire. 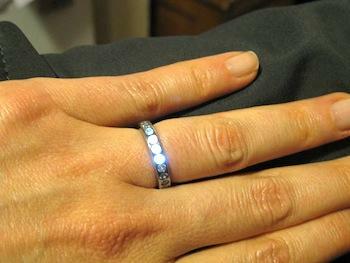 Ben Kokes designed and made a titanium engagement ring featuring 23 LEDs that light up when another person (Kokes) gets close enough. A copper coil in the ring picks up power by induction from the magnetic field generated by a transmitter Kokes wears on an armband. On his blog, Kokes details the five-month process of designing and building this ring, learning what he had to learn about working with titanium along the way. It's an inspiring tale of an impressively eccentric idea realized in metal and light.